If you’ve spent any time thinking about the world’s dirty energy problem, you’ve probably pondered some impractical “What if?” scenarios. Solar panels in space beaming energy down, or covering Nevada in solar panels—that kind of thing. Well, a new study led by Yan Li, Eugenia Kalnay, and Safa Motesharrei at the University of Maryland actually asks something similarly out there. What would happen to the Sahara if it contained enough wind and solar farms to supply the entire world’s energy needs several times over? Why the Sahara, you ask? Apart from the obvious things—lots of open land and a pretty potent solar resource—the area’s climate has shown to be pretty sensitive to nudges. The Sahel region between the Sahara Desert and the wetter lands to the south, in particular, can easily become wetter or drier with small atmospheric changes. And since studies elsewhere have shown that wind and solar farms can have an influence on local weather, it’s interesting to consider what effect they’d have in northern Africa. With no constraints on their scenario, the researchers opted for the “supersized” version. In a climate model, they simulated the effect of adding three terawatts of wind power—a little more than the world’s current total electricity use. Next, they added 79 terawatts of solar farms. Global energy use of all types (including fuels) is about 18 terawatts today, so this is a scenario where all the fuel a growing world could want are made in the Sahara, and Africa’s drinking water is probably desalinated, to boot. In all, this is something like nine million square kilometers covered by wind and solar farms—nearly the area of the United States. Even though the wind farms produced a small slice of the total energy, they had the larger climate impact in the model. Average temperature in the region increased about 2°C, primarily because nighttime temperatures couldn’t cool off as much. Precipitation, meanwhile, roughly doubled. A model simulation with just the solar farms showed about 1°C warming (this time mainly due to warmer afternoon highs) and a 50 percent increase in rainfall. With both the wind and solar farms in the model, rain effects combined for a 150 percent increase, while temperature rose about 2.7°C. While the neighboring Sahel enjoys a similar boost to rainfall, it actually gets slightly cooler rather than warmer. Enlarge / Results of the model experiments. 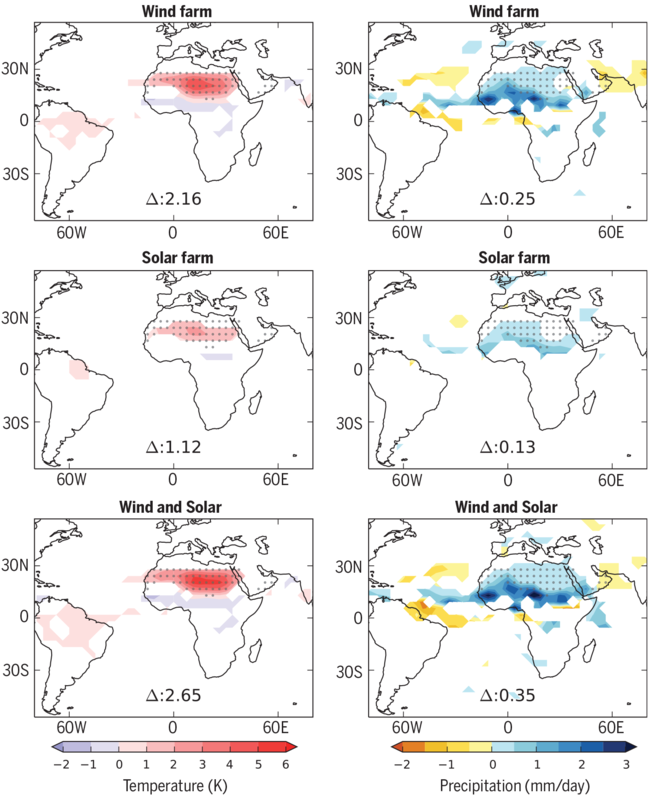 The number at bottom middle of each map is the average change across the Sahara and Sahel region: temperature in kelvins/degrees C and precipitation in millimeters per day. The weather processes in play are slightly different for wind and solar farms. Wind farms on this scale essentially make the Earth’s surface rougher, slowing wind speeds a bit and changing the mixing of surface air with the air just above it. Slower winds experience less of the Coriolis Effect that bends straight-line winds because of the Earth’s rotation. The end result in this region is that air masses are pulled together and upwards a little more strongly, bringing in more moisture that condenses into rain clouds as the rising air cools. Solar panels, on the other hand, reflect less sunlight than the desert sand. That causes some surface air warming, which also gives a lifting boost that wrings moisture out of the air. The real key here is the way that vegetation responds to weather changes in this climate model. More rain obviously means more plants in this rain-limited landscape. Vegetation efficiently takes soil moisture and releases it as water vapor into the atmosphere. And plants—like solar panels—also reflect less sunlight. It turns out that only about half of the simulated temperature effects and 20 percent of the rainfall increase are directly due to the wind and solar farms. The rest is an additive effect provided by the expansion of happy little plants. In fact, the reason the Sahel gets slightly cooler is that the plants’ release of water vapor cool off the surface, just as sweating cools your skin on a hot day. While the change in rainfall certainly isn’t enough to turn the Sahara Desert lush, the researchers say the difference in the Sahel “is large enough to have major ecological, environmental, and societal impacts”. So if we were to put enough renewable energy generation in the Sahara to power the world, not only would we do away with the global climate impact of our energy system, but it seems like parched life in the Sahara and Sahel would receive a windfall of rain. Of course, there are a million logistical reasons why this isn’t a particularly practical or likely scenario. The researchers also point out that the more efficient solar panels become, the smaller their influence on local temperature. And for smaller-scale wind and solar farms, their specific locations and layouts could also alter the weather impact. The researchers played around a little with simulating massive wind and solar farms deployed in other deserts, but nothing else showed results like the Sahara. The combination of size, location, and pale land surface color (meaning more reflective) makes this region uniquely sensitive to weather-changing wind and solar farms. So if you want to daydream big, the Sahara is an interesting place to do it. Science, 2018. DOI: 10.1126/science.aar5629 (About DOIs).